Unica e trendsetter band formata nel 2006 da noti musicisti dell'ambiente rockabilly italiano,Wheels Fargo & the Nightingale finalmente porta in scena un sound che da queste parti non si era ancora sentito ma che ha in breve tempo influenzato le band di tutta Europa con l’introduzione di banjo, violino e mandolino. Il quintetto propone brani della tradizione hillbilly degli anni '40 e '50 filtrati da un nervoso boppin’sound di impronta rockabilly, in più presenta diversi brani inediti scritti parole e musica da Antonella Tambakiotis (voce solista) e Wainer Rimondini (contrabbasso e voce) distribuiti nei tre dischi pubblicati su etichetta Part Records (Germany). Il sound assolutamente vintage è marcato dall' "usignolesca" voce solista femminile di Antonella, valorizzata dai frequenti interventi corali in bluegrass style, banjo, mandolino, violino, contrabbasso, chitarra ritmica, steel guitar e washboard. Dal 2007 hanno suonato nei maggiori festival Rockabilly, Country e Roots europei: Rhythm Riot (UK), Walldorf Rock'n' Roll Weekender Germany (due edizioni) , Vintage Roots Festival Italy (due edizioni), Motorcycle Gang Jamboree, Hillbilly Rumble, Good Rockin' Tonight (due edizioni), Moondogs Weekender, Nicole’n’Roll Weekender, Mirande Country festival, Dream Fish Custom, Wien Rockabilly Attack, Summer Jamboree, American Journey's festival Cambrai . Nel 2014 sono stati ingaggiati per un fortunato tour in Russia ( Mosca e San Pietroburgo) , più Greasy Days Festival South France, Old Drippers Fest France, Hemsby #53 England, Craponne Country Rendevouz.. Del 2015 è anche il tour danese, il Monster Hot Rockers, South Side Rumble Swiss, The Rose Maddox Tribute Night Montrevel en Bresse, Trash Town Rockabilly Weekender 2016 (CH), Hoedown Weekender #5 (UK)….e molti ancora! 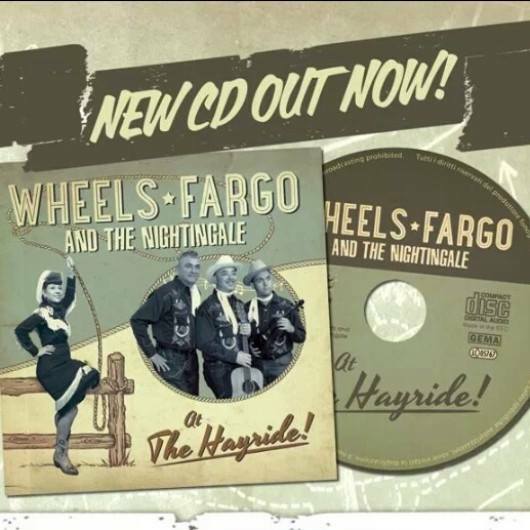 The original trendsetting band composed by well known musicians of the italian rockabilly scene, Wheels Fargo & the Nightingale bring on stage a different kind of hillbilly vintage sound unheard in these areas that quickly infected many bands around Europe with the rough sound of banjo, mandolin and fiddle. The quintet presents a choice of traditional 30's to 50's country-bluegrass songs, filtered by a strong boppin’rhythm, plus many original compositions, lyrics and music by Antonella Tambakiotis. Antonella's extremely high-toned leading voice supported by bluegrass style choruses, banjo, double bass, rhythm guitar, fiddle, mandolin, steel guitar and washboard , strongly marks this unique Wheels Fargo & the Nightingale vintage combo. The band toured all the most important european Rockabilly, country and roots festivals like Rhythm Riot (UK), Walldorf Rock'n' Roll Weekender Germany (two editions) , Vintage Roots Festival Italy (two editions), Motorcycle Gang Jamboree Italy, Hillbilly Rumble Germany, Good Rockin' Tonight France (two editions), Moondogs Weekender Italy, Nicole’n’Roll Weekender France, Mirande Country festival France, Dream Fish Custom France, Wien Rockabilly Attack Austria, Summer Jamboree Italy, American Journey's festival Cambrai (FR) . In 2014 the band successfully toured Russia ( Moscow and Saint Petersbourg) , plus Greasy Days Festival South France, Old Drippers Fest France, Hemsby #53 England, Craponne Country Rendevouz France.. 2015 the band minitours Copenhagen (Denmark), Monster Hot Rockers France, South Side Rumble Swiss, The Rose Maddox Tribute Night Montrevel en Bresse, Trash Town Rockabilly Weekender 2016 (CH), Hoedown Weekender #5 (UK) ….and many more to come!